NZ fur seals are a native species to New Zealand. About 2 million seals inhabited New Zealand before the arrival of Europeans in the 1800’s. The fur seals were extensively killed for their fur and blubber in the 1800s and 1900s, driving them to the brink of extinction on the mainland. Now their population is bouncing back, and their numbers are increasing thanks to their status as a protected species. 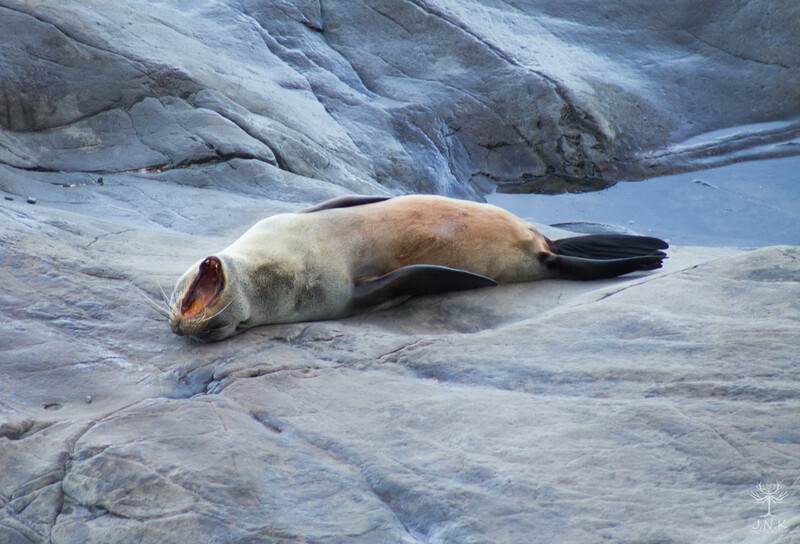 NZ fur seals are widely distributed around the coastal areas of the mainland and offshore islands. NZ fur seals are also found in the Southern Australia which is in their natural range. 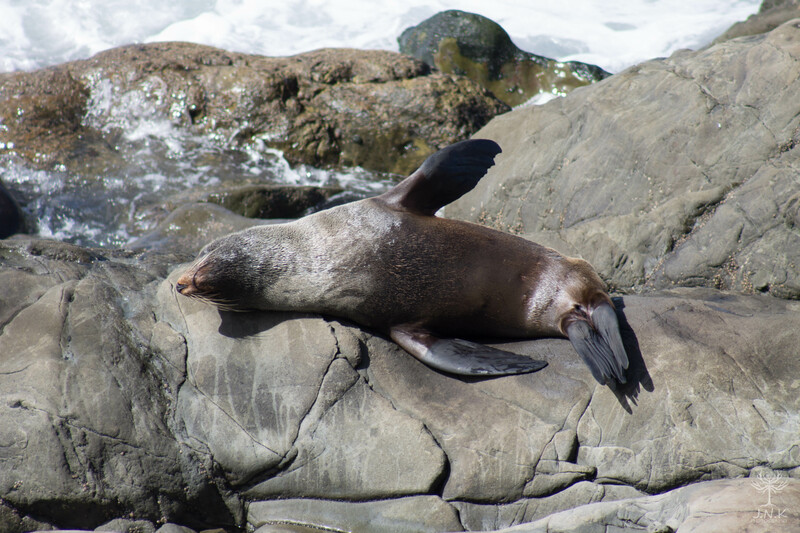 NZ fur seals prefer rocky coastal locations for resting and breeding. 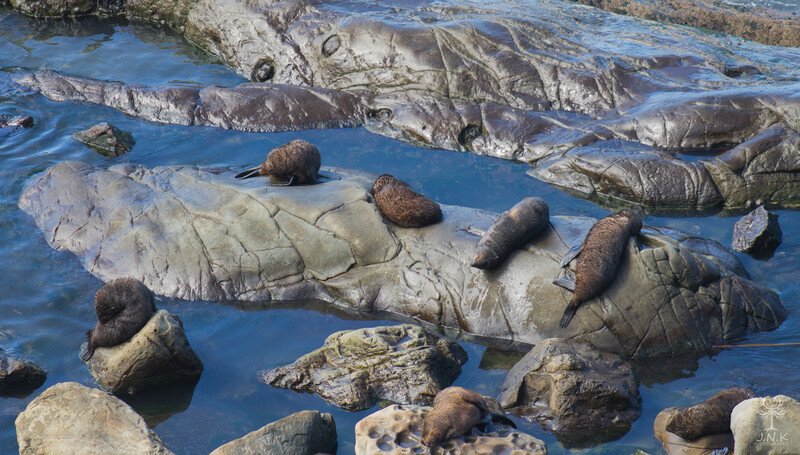 The uneven grounds and crevices created by the presence of large rocks and boulders provide seal pups protection against large males during the breeding season and provide shade, preventing them from overheating on sunny days. Fur seals are in the family Otariidae. Otariid seals are distinguished from phocid seals by their external ears and hind flippers (scuppers) that fold forwards, allowing greater ability to move on land. NZ fur seals have very dense fur and a thick layer of blubber for protection against cold waters when diving. This adaptation against frigid waters can result in the seals overheating while resting on land, especially during summer. To prevent overheating, resting seals will seek out shaded areas under large boulders and bushes, or make frequent trips to a close tidal pool to cool off. They also have large eyes to allow better vision in the dark while foraging in deep waters. Their large flippers allow increased mobility on land and in water. 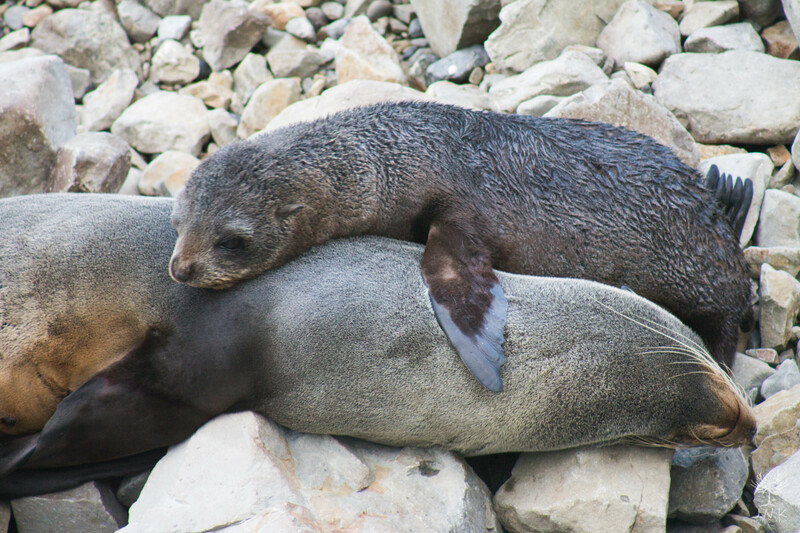 NZ fur seals show a significant sexual dimorphism in adults. Full grown males can measure up to 2.5 meters and weigh between 90- 150kgs, while adult females measure up to 1.5 meters and weigh around 30- 50kgs. Dominant males can be larger during the breeding season (up to 250kgs), where they put on great weight around the neck area to appear larger and for added protection while fighting other males for territory. NZ fur seals feed on a range of prey, from a huge variety of fish species to cephalopods such as squid and octopus. The primary prey species and the percentage of each prey item depends on where the population is located. NZ fur seals are the deepest and longest diving species of fur seal. NZ fur seals congregate in large numbers along the New Zealand coast, forming colonies. Breeding colonies are called ‘rookeries’, while non-breeding colonies of bachelor males and young seals are called ‘haul-outs’. 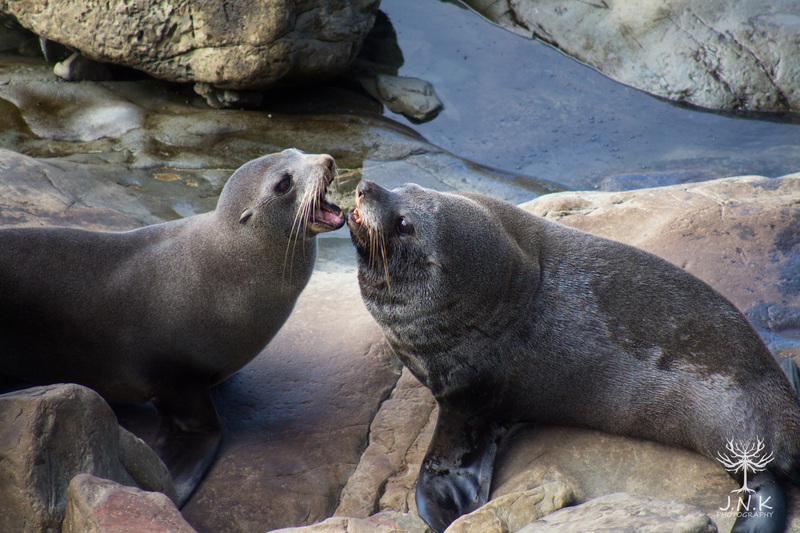 NZ fur seals live to about 16 years old, with females reaching reproductive age at 3-5 years old and males at 5-6 years old. However most males will not reach a dominant size until about 8-9 years old, when they are large enough to establish and hold a territory at a rookery during breeding seasons. This means that most males will not be able to reproduce before the age of 8, unless they are able to sneak into a rookery and mate with a willing female without being detected by the dominant male. 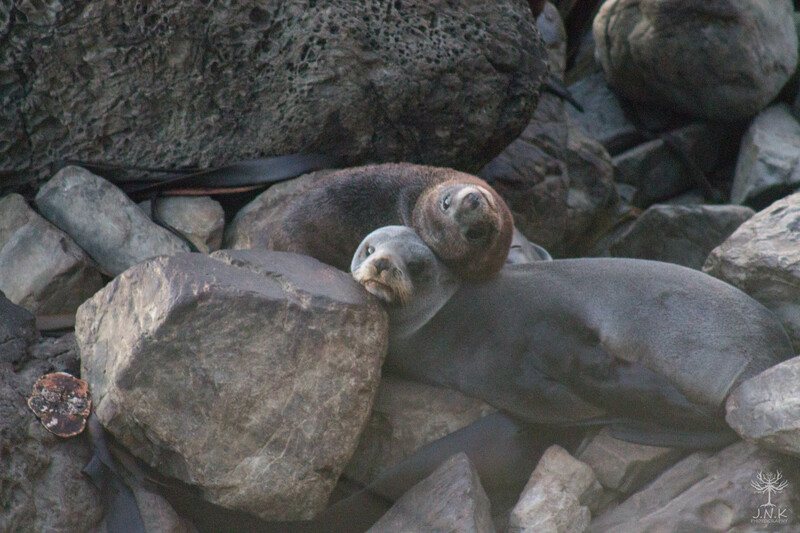 NZ fur seals show site fidelity behaviour, which means that they return to their birth site to breed and reproduce. 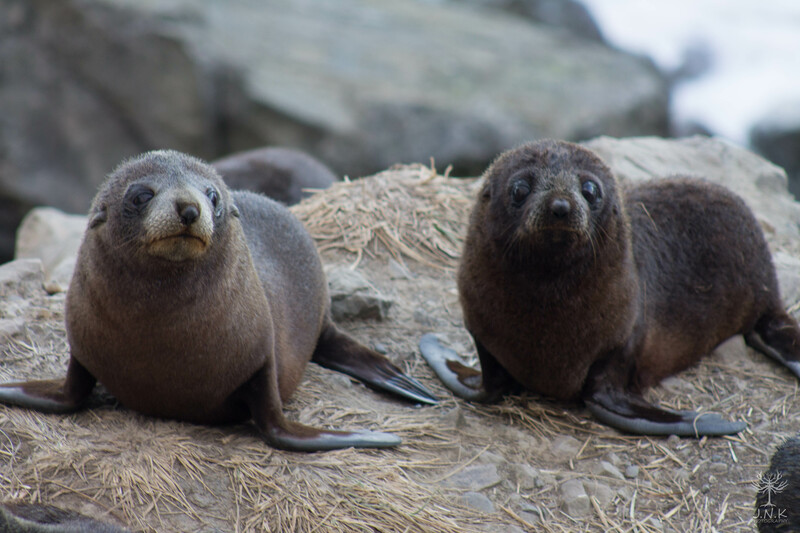 NZ fur seal breeding season begins late November and ends around late January every year. Breeding grounds are called ‘Rookeries’, and large males arrive around October to establish territory before the arrival of females. The males hold physical areas of the rookery during the breeding season, instead of controlling specific females. This means that the males gain access to females that rest and give birth within their territory, and that females are able to move about in between the territories of different males but not without some effort from the male to prevent them from doing so. Females arrive at the rookery in late November and usually give birth to only one pup. Seal pups are born with a full coat of black fur, and are able to open their eyes within about an hour. Newborn pups have limited motor skills, and are completely dependent on their mother for nutrition and protection. The females stay with their pups for 7-8 days after birth, and mate before leaving to the sea to feed for a day or two. The fertilised egg in the female will not develop into a foetus for about 3 months due to delayed implantation. As the gestation period is 7 months long, the delayed implantation means that the females will not give birth until approximately 10 months after the mating. Pups suckle milk for about 10-11 months before weaning around October and the females take regular feeding trips to sustain themselves and the pups during this time. As the pups grow older, the feeding trips become longer and the time they spend with the pup become shorter, as the pups suckle more and are able to survive for longer. When the female returns from a feeding trip or when she is separated from her pup, she searches for her pup by creating vocalisations and listening for a reply. Both female and pup are able to identify each others vocalisations in a colony of a few hundred seals. In close range, they use olfactory signatures for further identification. The motor skills of pups gradually develop and pups generally quite freely move about from the age of 2-3 weeks. Pups are seen playing in pools of water from December and the number of pups seen in pools significantly increase in January. As pups grow older, they become very active and inquisitive, resulting in pups spending a lot of their time playing in pools, playing with other pups and with objects such as marine debris or kelp. NZ fur seals in New Zealand do not have natural predators on land due to the lack of large native mammals species. However, they are preyed upon by a number of predators in the sea, such as sharks and orcas. 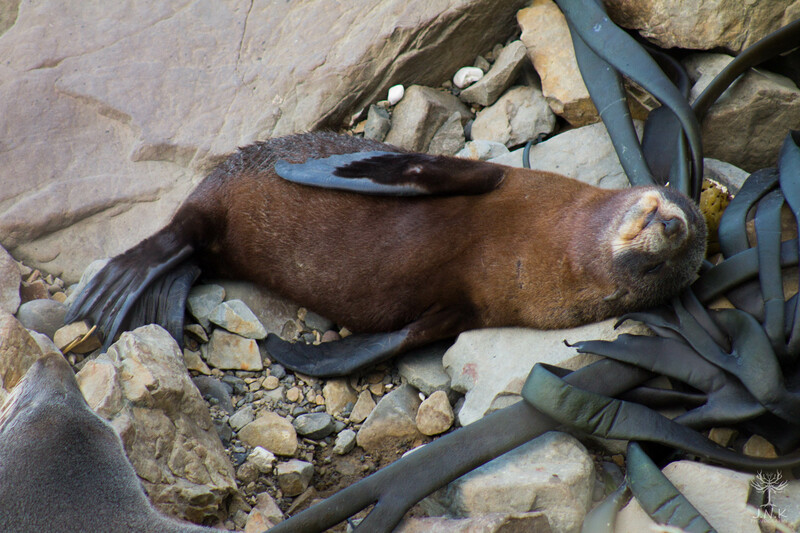 One of the serious threats to fur seals of all ages is entanglement in marine debris, such as broken fishing gear. Numerous fur seals have been seen with their necks tightly wrapped in objects such as discarded fishing lines and plastic. The greatest threat to newborn pups are being trampled upon by large males during the breeding season. Falling rocks and high level of adult female aggression can also be fatal to pups especially when they are young. Baird, S.J. (2011). New Zealand fur seals – summary of current knowledge New Zealand Aquatic Environment and Biodiversity Report No. 72. Chilvers, B.L. & Goldsworthy, S.D. 2015. Arctocephalus forsteri. The IUCN Red List of Threatened Species. Version 2015.2. <www.iucnredlist.org>. Goldsworthy, S. & Gales, N. (IUCN SSC Pinniped Specialist Group) 2008. Arctocephalus forsteri. The IUCN Red List of Threatened Species. Version 2014.2. Wilson, G. J. (1981). Distribution and abundance of the New Zealand fur seal, Arctocephalus forsteri. Fisheries Research Division Occasional Publication No. 20. 39 p.